It was cold and many leaves have already fallen off when Alex and I traveled to Stowe, Vermont in mid-November. The scenery was so beautiful that made waking up 5:30 AM in the morning and standing outside in the cold a worthwhile to see a beautiful sunrise over the mountains. As we drove through the state, the vast openness was clear. On the rolling green hills, farms were spotted from there and there. Vermont was a place where we can enjoy good local organic food. Right before Alex and I took off to Montreal, we stopped at Michael’s on the Hill to take a three and half hour cooking class called “A Taste of Vermont.” The name is quite self-explanatory. Michael, the chef and owner of the fine restaurant, Michael’s on the Hill, greeted us in his restaurant with warm handshakes. 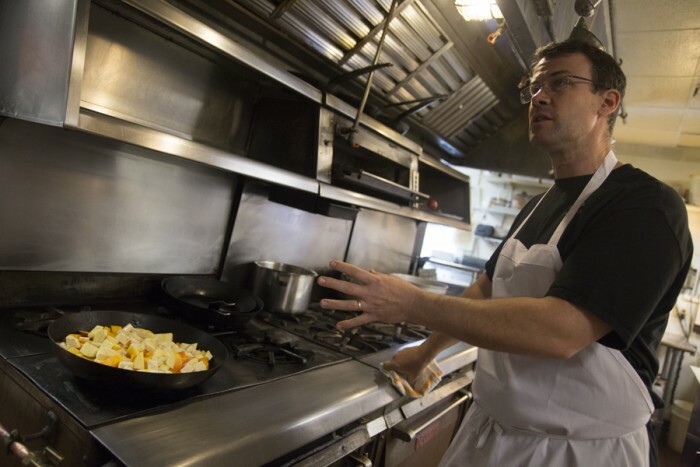 He hailed from Switzerland, has received accolades including being Vermont’s first “Chef of the Year” and been featured as a chef on television and in publications. When I asked him why he chose to live in Vermont of all places, he said it’s because he appreciated the culture and mindset of people in Vermont. 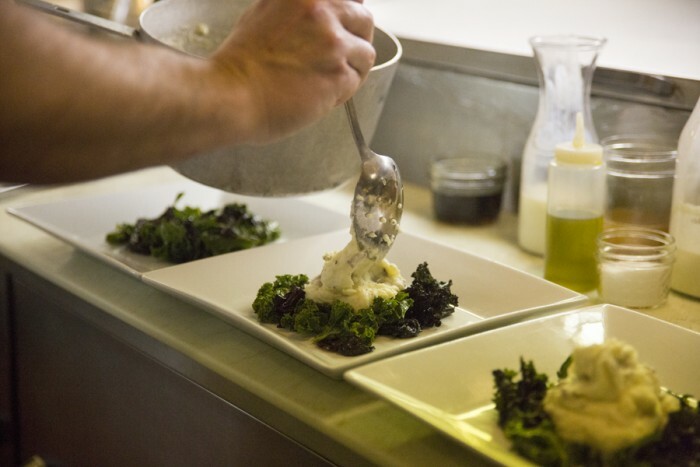 Michael ushered us into the kitchen of the restaurant where he had all the ingredients laid out on a table. Not all ingredients were local due to the season but many of them were local. For example, he said that the chicken and eggs came from a farm located down the road from the restaurant. 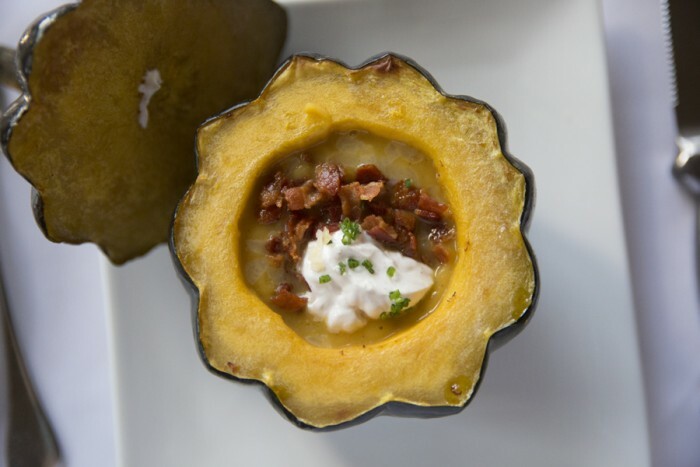 In this class, we learned how to cook butternut squash soup with bacon and cheddar cheese, skillet free-range chicken with apple cider sauce and mashed potatoes and maple crème brûlée. Vermont cuisine is not without apple cider, cheddar cheese and maple syrup! The main takeaway from the class is that all of these dishes may appear to be complex to make but they are actually simple. The simplest dishes are often the best and tastiest dishes. 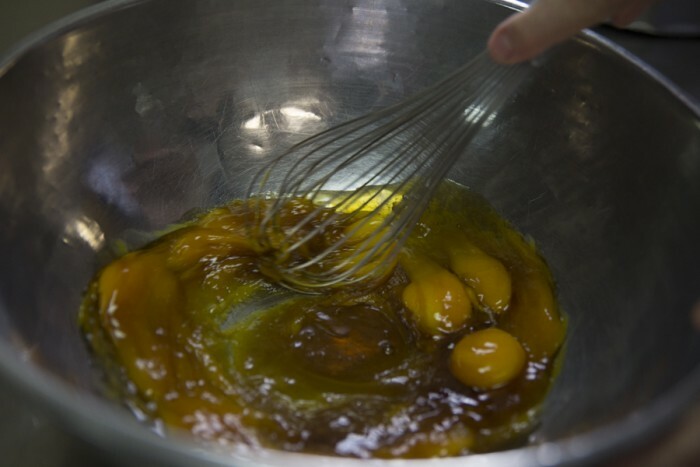 When we say simple, we mean that the number of ingredients is small. 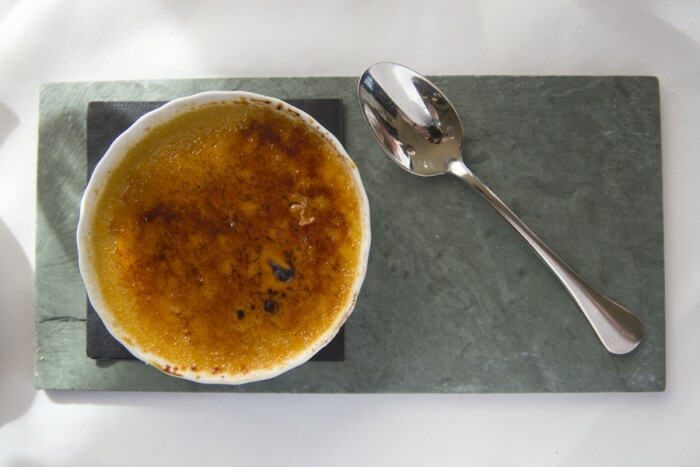 For example, maple crème brûlée consisted of only vanilla, eggs, cream and of course maple syrup. 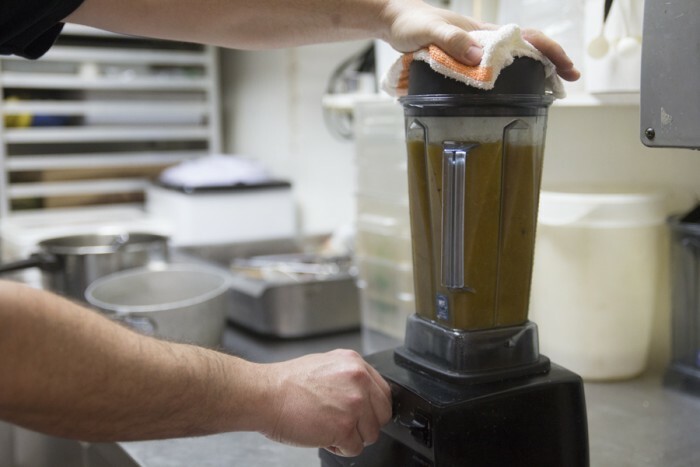 However, the process of making the dishes can appear complex because one has to make sure that each step is done correctly and in a correct order. 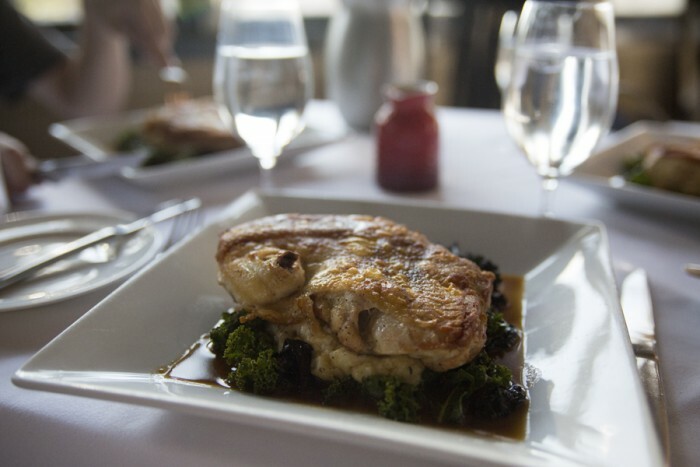 If one step is done incorrectly, the dish can become messed up. Michael also showed us different cutting techniques that would allow us to cut various ingredients with ease. After cooking eat dish, Alex and I enjoyed eating them in the lovely dining room of the restaurant with Michael. Each dish tasted so appetizing and fresh. They matched well with the cold weather of Vermont as every one of them was warm, allowing us to warm up our bodies. 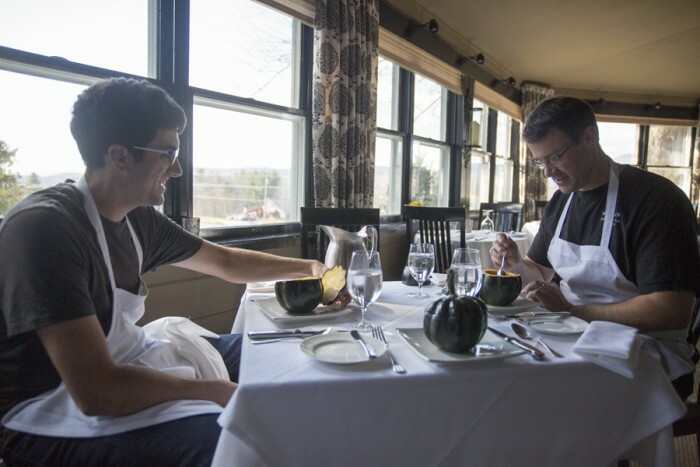 Alex and I left the cooking class feeling full and with memories of how Vermont truly tastes. 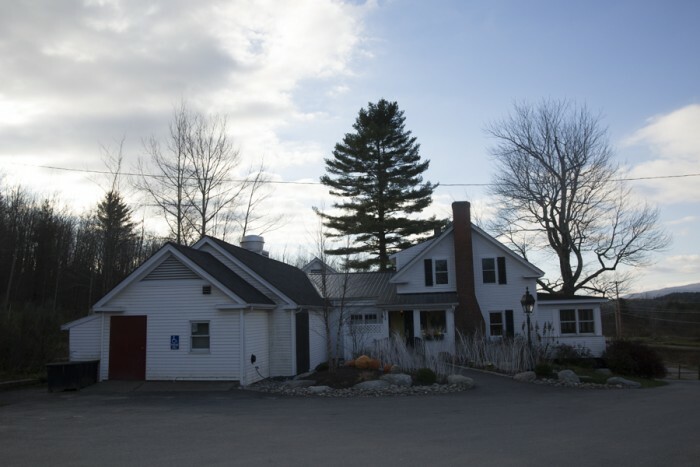 Michael’s on the Hill, a fine restaurant located in Stowe, Vermont. 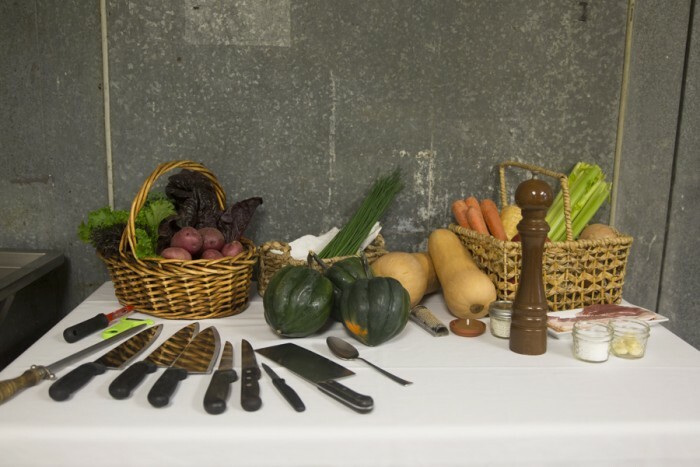 Michael had all the ingredients laid out on a table when we first arrived. 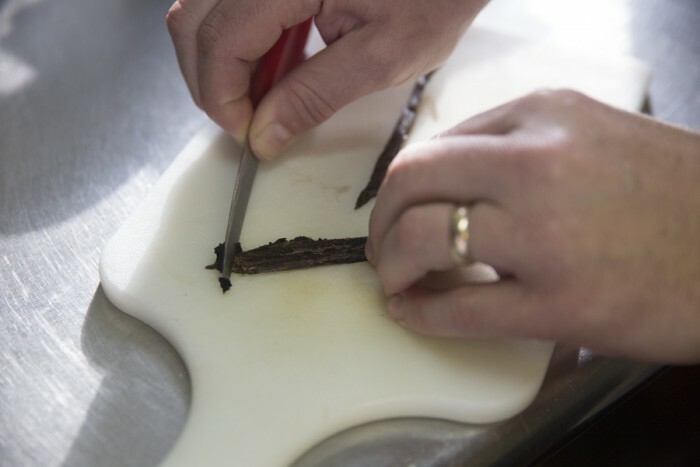 Michael shows us how to cut the vanilla beans for creme brulée. 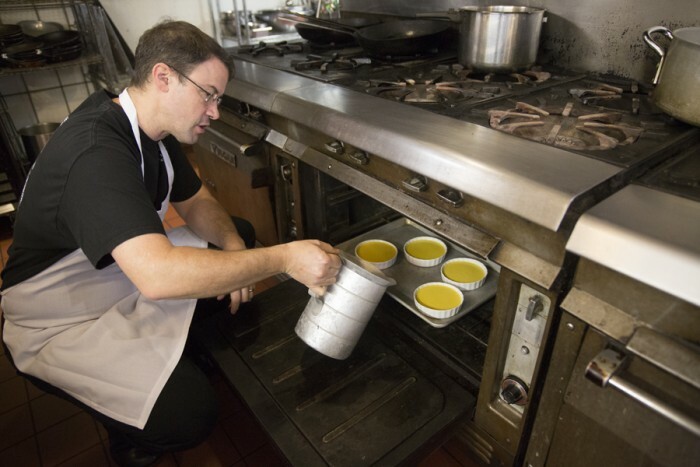 Michael shows us how to mix the ingredients for creme brulee. Michael shows us that we need to pour water on the pan holding the creme brulée, a cooking strategy to ensure that the dish cooks well. 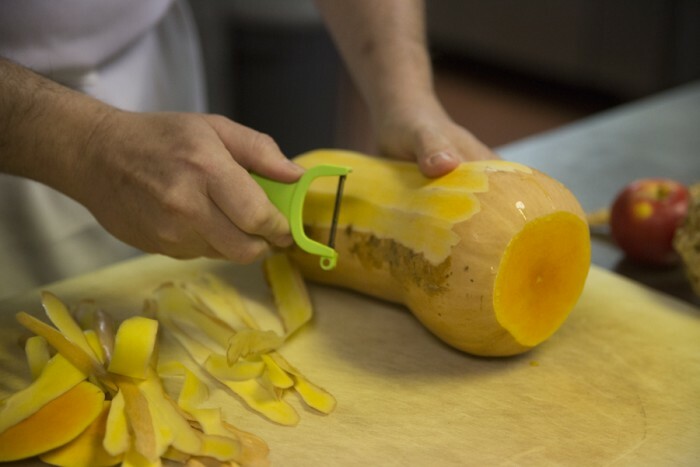 Michael shows us how to peel and cut the butternut squash. Michael demonstrates how to make a butternut squash soup with chopped butternut squash and apples. Michael shows us how to cut a raw chicken with bones still being intact. 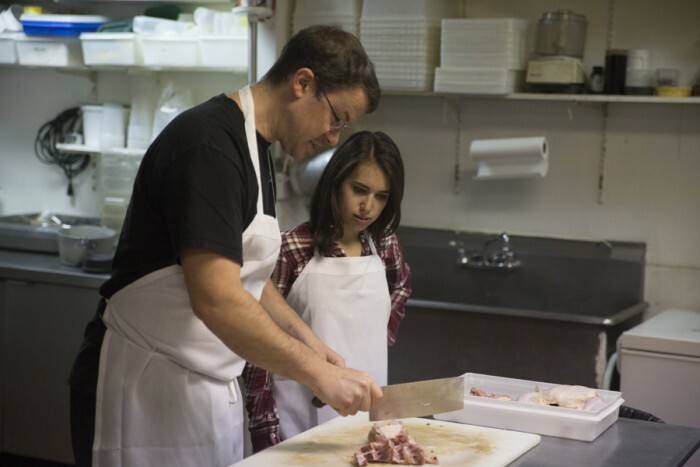 Rachel learns from Michael how to chop the raw chicken. 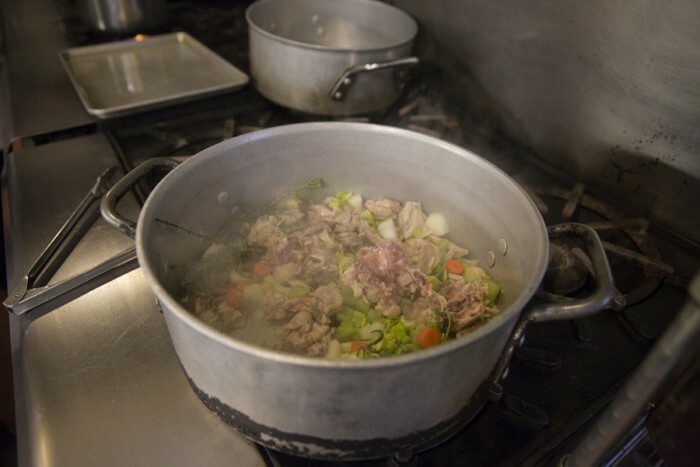 A pot is cooking vegetables and some parts of chicken, ingredients that are part of the apple cider sauce for the chicken. Michael blends the cooked butternut squash and apples for the soup. 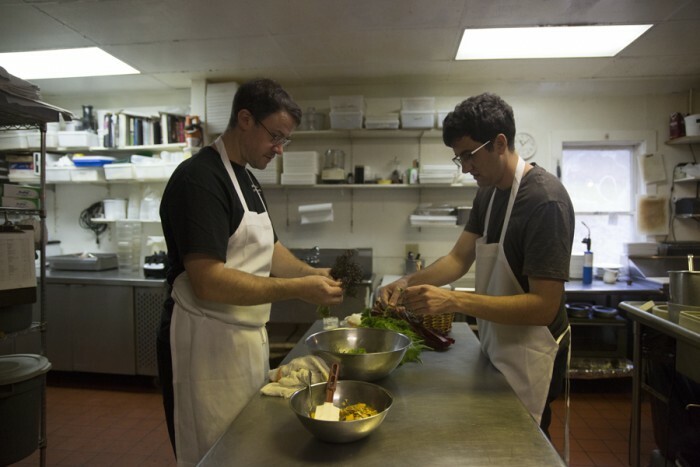 Alex assists Michael in cutting the vegetables for the chicken. 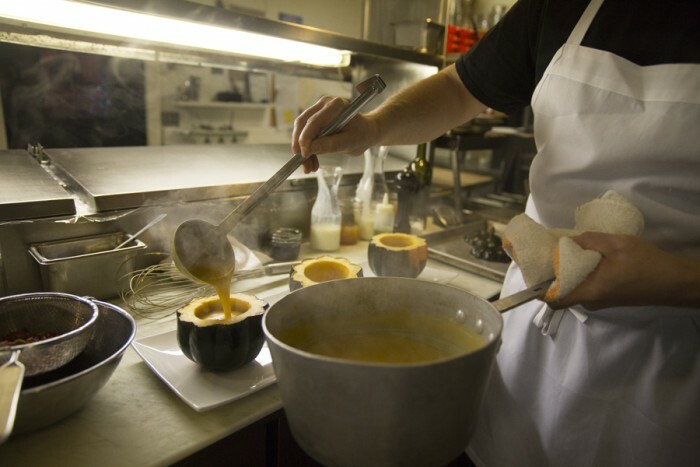 Michael pours cooked butternut squash soup into acorn squash bowls. Alex tastes the butternut squash soup with Michael in the dinning area of the restaurant. Butternut Squash Soup with Bacon, Cheddar Cheese and Creme Fraiche. 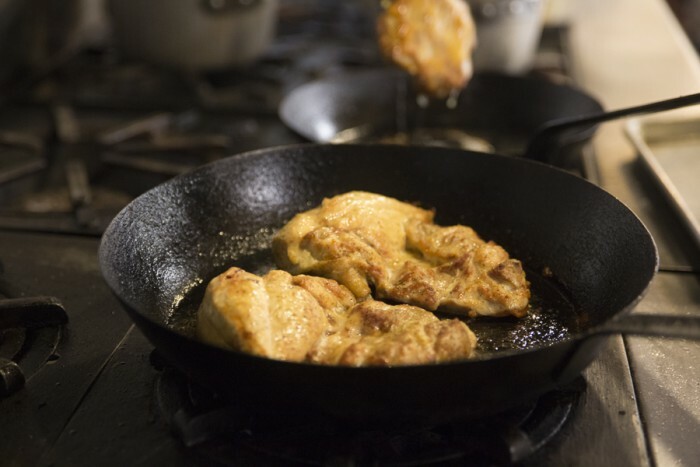 Chicken being cooked on a skillet. Mashed potatoes being served on plates. Alex learns how to brûlée the crème brûlée with a torch.